← Are you ready for self-employment? 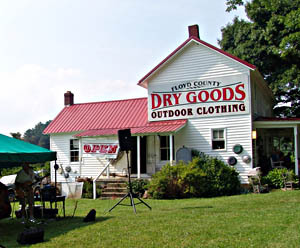 About mile marker 150.5, there is a dry goods store that you might enjoy visiting, if you enjoy browsing through old-time stores with merchandise piled everywhere. Amy Gravely, the proprietor, is the vital force who keeps this off-the-beaten-path store running and attracts crowds of friends and visitors to her Sunday concerts and impromptu craft shows featuring local artisans. In spite of a recent crippling injury, she maintains a positive outlook and has a cheerful disposition. Fortunately, she has help from other family members in running the store. I find a lot to admire in people who continue to make positive things happen even after an incident which normally would mark an end to any productive career. After you see this slide show on Flickr, you might want to mark down the next concert dates on your calendar. The Sunday concerts feature the Guard, a group of musicians from Franklin County who play rousing Bluegrass and Bluegrass Gospel music. Their future concert schedule is: August 19, Sept 9 and 23, October 14 and 28. 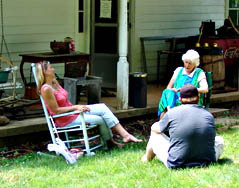 Families bring their lawn chairs and blankets and spend the afternoon listening to music and socializing and they also bring a dish for the regular picnic which begins after 5pm. You can see Amy most weekends and some weekday afternoons sitting in front of her store talking with visitors. If you can’t stop, wave as you go by. UPDATE: The Guard musicians have been playing together for about 15 years, according to Carol Yopp, who filled me in on the group. Carol is the wife of Roger Doss who plays banjo, harmonica, and several other instruments as well as doing vocals. Brian Greer plays bass. Alan Messenger plays guitar and does vocals. Will Staton plays the mandolin. They are also the house band at the Coffee Pot on Brambleton Ave in Roanoke where they play every Wednesday night from 6-9pm. This entry was posted in Seen around Floyd and tagged Alan Messenger, Amy Gravely, Brian Greer, Carol Yopp, Floyd County Dry Goods Store, Floyd County Virginia, Franklin County, Roger Doss, Sunday Concerts, The Coffee Pot in Roanoke, The Guard, W. K. Webster, Will Staton. Bookmark the permalink. Did the Dry Goods store used to be a bed and breakfast by any chance? Owned by a retired doctor and his wife? If you’re driving on the Parkway south – towards Meadows of Dan – it’s on the left. The building seems so familiar. Hope you guys have been spared this awful heat wave!